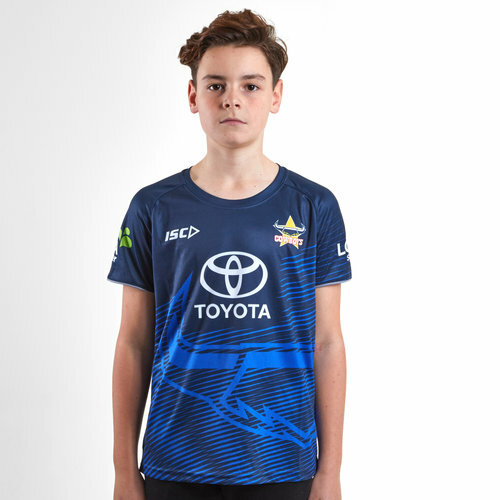 Fly the flag for the Cows when you're out and about or at Willows Sports complex in this North Queensland Cowboys NRL 2019 Kids Rugby Training T-Shirt from ISC. 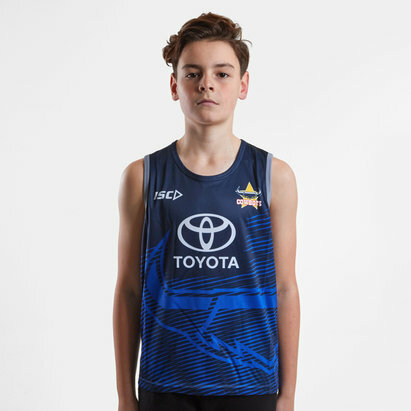 The Cowboys play in the Australian rugby league - the NRL's main competition is known as the Telstra Premiership due to sponsorship from Telstra Corporation and is contested by sixteen teams, fifteen of which are based in Australia with one based in New Zealand. It is the most viewed and attended rugby league club competition in the world. The National Rugby League is Australia's top-level domestic men's rugby-league club competition. This t-shirt combines the Cows traditional colour of navy with sky blue. It comes with a round neck and features a sublimated bulls head design on top of stripes which are all in sky blue. The ISC logo is on the right of the shirt with the Cowboys badge in the middle of the shirt under the collar. The team's sponsor - Toyota - is across the middle. This is the t-shirt that the players use to train in.